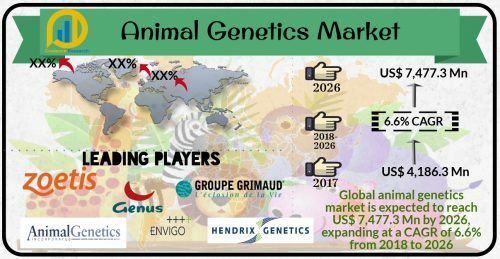 SANJOSE, United States - March 19, 2019 /MarketersMedia/ — The latest market report published by Credence Research, Inc. “Animal Genetics Market - Growth, Future Prospects, Competitive Analysis, 2018 - 2026,” the global animal genetics market was valued at US$ 4,186.3 Mn in 2017 and expected to reach US$ 7,477.3 Mn by 2026, expanding at a CAGR of 6.6% from 2018 to 2026. Based on the product types, the live animals segment shall be the major segment fuelling the market growth. The demand for animal meat from cattle, pork and goats and increased urbanization support the demand for this segment. High costs and time involved in selective breeding also have led to emergence of live animal testing for animal genetics. Among the services, genetic disease testing shall be the major segment determining the market trends. Growing awareness regarding animal health, and increasing genomic testing for prevention of loss from large scale breeding of such population drive this segment. Geographically, North America holds the largest revenue share for animal genetics. Increasing pet ownership, extensive animal husbandry and poultry industry and higher expenditure rates support the dominance of the region. On the other hand, due to the growing awareness, improving R&D facilities and increasing CRO activities are some of the key factors that drive the swift growth of Asia Pacific market.